More than 100,000 students at Indiana University will soon have a clearer pathway to graduation, thanks to technology that streamlines the course scheduling process. The university today announced a partnership with Civitas Learning to implement the company's Schedule Planner app across the seven IU-administered campuses, including IU Bloomington, Indiana University-Purdue University Indianapolis, IU East, IU Kokomo, IU Northwest, IU South Bend and IU Southeast. The Schedule Planner app integrates with IU's current systems so that students can manage the courses in their current degree plan, accommodate outside obligations, schedule break times and maximize credit hours. Administrators can use the system to enhance advising and planning services, fine-tune the master class schedule and balance course fill rates, a news release explained. The app will be available to IU students this fall, replacing a legacy home-grown tool. 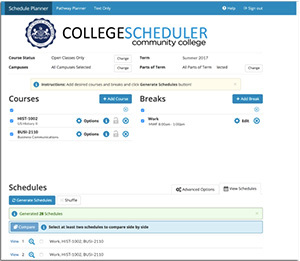 Civitas Learning reports that to date, 3.2 million students across the country have built course schedules using Schedule Planner. "On average, colleges and universities report up to a 3.1 percentage point increase in student persistence and up to a 3.5 percentage point improvement in graduation rates when using the app," the company said in a statement. "At Indiana University, it's our goal to provide a high-quality experience for every student enrolled, regardless of what campus they're enrolled at. This [partnership] provides a new opportunity to maximize the efficiency of course scheduling, and ensure that our students are on a path to success from the beginning," said Rebecca Torstrick, assistant vice president for university academic affairs, in a statement. For more information on Schedule Planner, visit the Civitas Learning site.